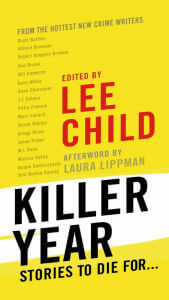 New York Times bestselling author Lee Child has teamed up with the International Thriller Writers for First Thrills, a showcase of many of the organization’s bestselling authors as well as rising stars in the genre. In “The Princess of Felony Flats,” a mysterious dwarf makes a risky play for the statuesque consort of a drug kingpin in a hardboiled retelling of a classic fairy tale. Introduced and edited by Lee Child with an afterword by Steve Berry, First Thrills features original, never-before-published short stories by some of the greatest thriller writers at work today. “The Princess of Felony Flats” is nominated for the CWA Short Story Dagger 2011. “The Princess of Felony Flats” is one of many fine stories in First Thrillsto get a nod from The Independent UK. “The Princess of Felony Flats” appears in the eBook First Thrills, Volume 4. Order for Nook here, or for Kindle here. First Thrills includes stories by New York Times bestselling authors Lee Child, Stephen Coonts, Jeffrey Deaver, Heather Graham, Gregg Hurwitz, John Lescroart, John Lutz (with Lise E. Baker), Alex Kava (with Deb Carlin), Michael Palmer (with Daniel James Palmer), Karin Slaughter, and Wendi Corsi Staub. The collection also serves as an introduction to those ITW has christened its rising stars, including Sean Michael Bailey, Ken Bruen, Ryan Brown, Bill Cameron, Rebecca Cantrell, Karen Dionne, JT Ellison, Theo Gangi, Rip Gerber, CJ Lyons, Grant McKenzie, Marc Paoletti, Cynthia Robinson, and Kelli Stanley. Couldn’t say exactly when he began to suspect she was a kept woman. He saw her from time to time, coming and going from her apartment across the breezeway. Second floor, toward the back. Potted fuschia next to her door. He’d stand at the kitchen window, big Tupperware bowl of rice puffs in his hand, and watch her. Sometimes the wind blew through the open breezeway. Every time he saw her she looked good. He was trying to decide if he should even talk to her—invite her in for a drink, get to know her. Part of him said, No, no, what if she rejects me? It would be awkward if they happened to pass each other afterwards. Another part of him said, What if she doesn’t reject me? What if we hit it off but then it doesn’t work out? That would really be awkward, and his lease didn’t run up until September. But then another part of him said, What if it did work out? What if they really liked each other? What if they hit it off and it turned into something real? But then he thought, no, no, what is real? Did he know what real was? Could he really be sure? Besides, she was really beautiful. She always looked good. She came and went at odd hours. Sometimes he would see her getting out of her car at seven o’clock in the morning as he pulled away in his. Dressed to the hilt — sleek pants, translucent blouse, tight, sorta sultry, edging toward trailer trash sexiness and yet, somehow, with an air of confidence and allure. He knew her clothes were expensive. Once he saw her with a Nordstrom shopping bag. The apartment was, well, the apartment complex was out of the way. Nice enough, advertised as luxury apartments, but he knew better. Luxury if you were used to one bedroom next to the railroad tracks, soot on the walls, tattered carpet, rattlely pipes. But not nice if you were used to serious luxury. Granite countertops, inlaid floors, double-head showers. Hell, the kitchen sink didn’t even have a spray nozzle. But that just contributed to his idea that maybe she was a kept woman. Because after all, you’re going to keep your woman out of the way if you’re some fat cat, got a wife, coupla kids, kids maybe getting close to college, or maybe one of them is in college, the other one in high school. You’ve got expensive dogs that you pay to have groomed four or five times a year. You make more money from dividends than you do from your salary. Your wife doesn’t know how you spend your evenings, but she feels pretty certain it’s not all board meetings and business dinners. On the other hand, she knows she’s got a good thing going. She can do her volunteer work, chair her committees, get together with her girlfriends for spa trips. Maybe she’s even got a little something going on the side herself. It’s all right. They don’t exactly dislike each other, fat cat and wifey, they’ve just moved on to other things. And for him, that other thing happens to live across the breezeway. He kept her there because the place was nice, but not too expensive. She’s not likely to be seen by anyone important. The keeper, he’s not going to show up at her door. He’s got more sense than that. No, he’s going to put her on a plane when he’s got a trip to the Bay area for a investor meeting. They’ll have dinner together, spend the evening, see a show, do other things. Then she’ll come back to her little out of the way place. He works out of the city so she’s often elsewhere. He must have one of those corporate apartments, the kind of place where you put up guests from New York when they come into town. A little less public than a hotel, a little more personal. You can control the luxury. You can control the help. He noticed that she warmed up as time passed. The first time he saw her he said, “Hello,” but she only made a soft sound that might have been “Hi,” or might have been something else. Wouldn’t make eye contact. Breezed past. Smell of perfume. He didn’t know perfumes. The only one he recognized was the one he bought for the woman who’d left him the year before. L’Eau D’Issey. He recognized that one even now, still smelled it sometimes even though he thought it was probably his imagination. Maybe that was another reason he didn’t approach her. There was part of him that wanted the old girlfriend back. Maybe he thought to himself that if he found someone new, he’d doom any chance of a reconciliation. Didn’t he want a reconciliation? Yeah. Yes. Did she? No. . . no, no. Or, who knows? Maybe he didn’t and she did. It was complicated. Or maybe it was the simplest story in the world and he oughta get the hell over it already. Still, he knew he wasn’t the kind of guy that beautiful young women kept by wealthy old men went for. Because he wasn’t young enough or attractive enough to break past the fact that he also wasn’t wealthy enough. Not that he was bad looking guy. He looked all right. He wasn’t exactly in shape but he wasn’t unfit. Ran a mile or two a coupla times a week. But he also drank one too many microbrews on Wednesday nights after work. Hump Day. Looking at the bar women and wondering if they took Hump Day as literally as he did. In any case, over time she got more and more friendly. Ran into her the other day and she actually seemed to smile at him. Paused for a moment. “How you doing?” . . . “Good. Nice to see you.” Then she glanced down at the sack of groceries in her arms in that way that said, Well, gotta go. . . got this sack. Went into her apartment. He couldn’t really say for sure that she was a kept woman. He had to admit that he’d only encountered kept women in movies and novels. Maybe they didn’t exist. Oh, he supposed they did exist. But how did you find a woman like that? You know, when you’re a middle-aged wealthy guy how did you find that woman? Or did they find you, go trolling for you? What kind of a woman becomes a kept woman? Pretty, that seems to go without saying at least. That’s how they always were in the movies and TV and in the tawdry mysteries that he occasionally read. But then the other thing that they were, based on this one across the hall, was maybe sometimes a little tired looking. Of course, if you come home at seven a.m. you’re going to be tired no matter where you’re coming from. Even if you got some sleep the night before, even if you just put yourself together after snoring the night away in a corporate apartment up in town. Did she have a job? Did she have goals? Sometimes in the murder mysteries they were taking classes at the community college during the day, working on their art, learning modern dance. Maybe that was it, woman shows up at seven o’clock in the morning, maybe she’s not a kept woman at all, maybe she’s a dancer. Not in an off-Broadway play either. A dancer at one of those places where they stick dollar bills in your g-string. He thought about her, wondered if he could bring himself to stick dollar bills in her g-string, given the chance. Probably not, since he had better use for dollars than to go into a strip joint and throw money away just to watch an inaccessible woman dance without any clothes on. Maybe if someone else provided the cash. Not that anybody had a clue how he felt. There he was, inside his own private space, go to work, joke innocuously, never make a serious connection with anyone, go home, fix his frozen dinner, watch The Daily Show on TiVO, smile at the woman across the breezeway, wonder if she was kept. A kept woman. Thinking maybe I should talk to her, but then thinking, no, no, I don’t think so, because, well, because it might not work out, and his lease didn’t run up until September.